There are a number of situations where the side view cameras on our RV’s fail and need to be replaced. While these cameras can be physically damaged by collision, the most frequent failure that I have noticed is that they no longer function at all (no image) or the image is severely distorted by sun glare or from wash damage or the like. Replacement, as with any modern electronic equipment almost always requires adjustment or alteration since the new version is almost always incompatible with the original in one way or another. Further complicating the replacement is the left and right image issue, should you mount a side camera designed to fit the other side of the RV then the images will be upside down. Since these small electronic items are part of a larger system, RV makers have custom applications supplied by an outside supplier so that it is a ‘plug and play’ installation on the assembly line. Unfortunately, when a customer seeks the original equipment it is often no longer available or superseded by another version. This can create additional effort to replace the camera. You may be required to deal with a different mounting configuration, the need to paint the camera or housing, attaching a different connector to be compatible, among other issues. Originally the side view cameras were mounted on the front side of the RV body, then they made their way to an attachment on the rear view mirrors and frequently today they are an integral part of these side mirrors. Not only has the location moved, the size of the aperture and the light sensitivity has also changed, with the newer cameras having a larger lens and much better low light and contrast than their early brethren. All of these factors makes replacement a challenge. On my 2009 coach, we experienced problems during the warranty period and both side cameras were replaced. This required each one to be selected depending upon which side it was to be mounted, then painted to match the body, and installed carefully so that the camera gave a proper orientation within its field of view. During four years of use these cameras performed flawlessly. Last winter, I had my coach professionally washed and waxed near the beginning of our southern stay. Six weeks later when I left, I discovered that the right side camera had a very cloudy, virtually undiscernible image when activated. My initial assumption was that the camera had water in it, however logic prevailed when I realized the camera had been exposed to the sun each day for five weeks. Any residual water that may have made its way into the camera would have evaporated long ago. Being the tinkerer that I am, I deftly cut away the sealant, unscrewed the cover retaining screw and removed the camera from its painted housing. The camera on our coach is actually glued in place to set it in position. It was fairly easily to separate the camera from the housing. I disassembled the lens assembly very carefully and discovered that it contained a series of optical lenses and spacers, some of which can be rotated to sharpen the image. Cleaning each lens and reassembling it provided the hope of a clear view, however that was not to be. I reinstalled it and decided I would have to look at replacing it when I got home. Fortunately I have an excellent camera and projector repair shop nearby and they looked at the camera, only to conclude that the inner lens, closest to the CCD screen (or sensor in camera parlance) was cloudy, likely from the acids in the carwash cleaning fluid actually etching the plastic lens No amount of polishing would return it to proper operation. The lens assembly was not available, the camera was no longer made, thus replacement was my only viable option. 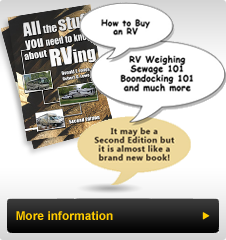 As many would do after learning this, I searched the used RV parts sellers but did not come up with a suitable camera. After placing a call to the RV maker, I learned that a replacement was available however it was half again as big, was a different shape and it would require painting to match. It was about $350 plus shipping. Further complicating the replacement was the fact that the base would not completely cover the existing camera mounting area meaning that part of the front cap of the RV would need to have the DiamondShield® partially removed, the area repaired and repainted in addition to painting the camera body. The new camera would look quite different from the left side one that was operating perfectly. This was becoming an intricate and expensive job! During my tinkering phase I learned that the left and right side issue was all about how the camera was mounted in the housing and that if it was rotated 180 degrees, an upside down image would be right side up. I learned how to do this by unscrewing some very small screws using a set of jeweler’s screwdrivers. I also knew that I could simply glue it in place with the opposite side up to turn the image over. This knowledge freed me up to choose a left side camera (even though I required a right side one) if it fit in all other respects and that expanded my potential selections. I also learned that these camera were pretty consistent in their wiring with a red (+12V) power lead, a black or white (-12V) ground lead and a Yellow or clear (often shielded) video wire. Note: The first photo shows the original camera which as a large ‘P’ printed on the top. With this P orientated upwards the camera would provide a view along the passenger side of the coach. Notice that the lens assembly has a knurled cover that when removed gives access to the complete lens assembly. I constantly searched on eBay and Amazon for replacements. Usually I was able to tell by the picture whether the camera would fit physically in our RV’s existing housing. This housing had an approximately ½” (1.27cm) diameter hole in the end facing the rear of the coach through which the camera lens assembly slightly protruded. I located a camera (actually 2) that were one single unit around the lens area that looked like it would fit in my housing and all that I would need to do was enlarge the hole through which the lens would project from. They had metal mounting hardware that looked adjustable and the wiring connector was quite different from the one on my camera. I decided that I would buy both since one had failed and I expected that the other might and if I had a matching set then I’d have a replacement ready to go. After a little negotiation I was the owner of the pair. The third photo shows one of the cameras I acquired. As it turns out they were located in the US and we would be attending a coach Rally in the US within a couple of weeks, so I elected to wait to install them until I was at the Rally. The camera supplier was ASA Electronics and they were located in Elkhart, IN. Since we were on our way to Goshen, IN about 10 miles away, I stopped in to see if there was an adapter or wire harness that mated to the ones on the camera. I learned that these cameras were sold originally to Velvac Mirror and were the cameras used in new RV‘s with mirror mounted cameras. Velvac actually removed the factory connector and installed their own. This explained the shorter wire that was on each camera. There was no adapter however I was able to confirm the wiring code and would be able to use the connector from the original camera. Fortunately I had some extra wire on my RV so the connection would reach. After making the wiring connections by soldering each one and protect each wire with heat shrink tubing, I finished the wiring by wrapping it in tinfoil to shield the wiring connections from other interference. Because the cameras I bought were left side versions, I had to rotate the selected one 180 degrees in its housing. Since it had a bracket attached to the housing to mount it, I had to do some modifying to retain the mounting bracket. I was able to use one of the two screws to locate the camera on its bracket. At first you would think this is less secure until you recall that the original was simply held in place with glue. With this camera I had a very secure bracket that would be screwed to the camera with one screw and to the RV body with two. This mounting method was far more secure and as a bonus it allowed the camera to be aimed with less effort. The remaining challenge was to locate the lens so that it projected through the existing lens opening in the housing. Using Duct Tape to secure the bracket to the old camera’s plastic base mounted on the coach generator compartment access door (lower front cap), I was able to adjust its projection through the existing lens access hole and almost center it within the hole. (See photo) The field of view of this camera is wider, although I chose to have its inside angle about 4” (10 cm) off the RV body. It is so rare that I need to see the RV body when using this camera and the wider field of view makes moving into lanes of traffic to my right easier, since I can see farther to the right of the coach, well outside of mirror view. While the wider field of view was immediately apparent, I was surprised by the additional clarity of the image, the improvement in low light situations and the lack of glare from the sun and headlights. The camera has a far greater light range. With the cover installed and properly caulked, most people would have difficulty knowing that the right camera is not a factory original. The real beauty of all of this, besides the improvement in performance, is that the total cost was 1/3rd of what a new camera would have cost, I have a matching replacement for the other side and I did not need to do any painting. This retrofit was truly a win-win for us. So the lesson learned from all of this is that you can with a little work and ingenuity replace the side mounted cameras on your RV without having to go the new camera route. By being specific in your search, you should be able to find a used replacement that will work as well if not better than the original.